I wake up with excitement today because it is Amy (niece) and my hubby's advance birthday celebration. I made a shrimp dish and everybody loves it. It is an experiment but, they call it gumbo...hmmm... but, it is not. I only stir fry it with lots of Datu Puti Soy Sauce. The magic ingredient LOL! 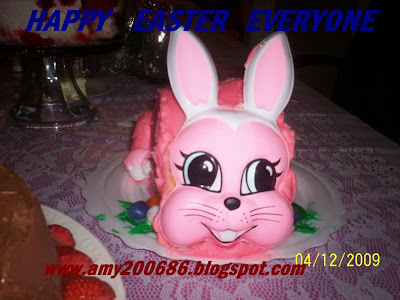 Happy Easter to all of you. In the family, when we get together, we are always 14 and that includes the BF of the teenagers in the family. Was amazed that they wanted me to join the egg hunting...hehehe....my FIRST time ever! 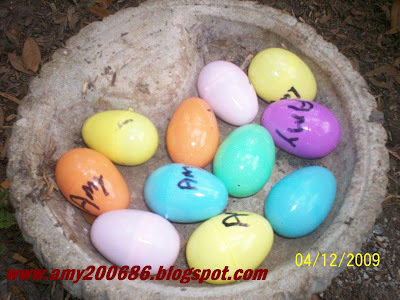 I found 12 eggs with my name of course and hidden in the thick bushes in Amy's huge backyard. Dang! Bigger than ours. See the THICK bushes below? LOL! There are only 8 of us who was included for the egg hunting. EACH has at least 12-17 eggs with money in it. 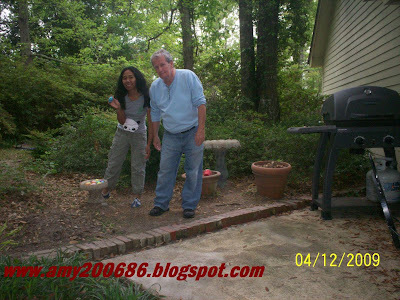 No worries , the bushes are thick but we did not find any snakes hahaha. I found mine at the front yard though, some on the tree trunks, on the bench, flower pots. I enjoyed it a lot. How was your Easter? hmmm....beach probably!